Benjamin was married twice, first to Hannah Danford and, after her death, to Phebe Lewis. There is no record as to where Benjamin and Hannah were married. He had seven children with Hannah. Benjamin was already married to Hannah when he arrived in Noyan with at least three children by her: ( John, Cynthia and Elizabeth). We don't know where they were born. Henry was born in 1825 in Albany. Daughter Hannah died in 1830 but we don't know if she was born in Noyan or before they came there. Benjamin's will reveals two other children, Sally and Daniel, about which we know virtually nothing. 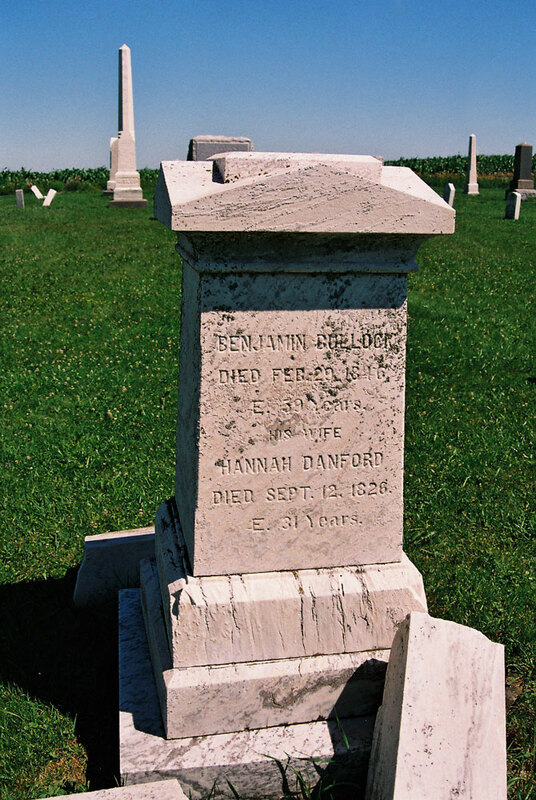 Benjamin's first wife, Hannah Danford, died on September 17, 1826. The headstone (above), shows the date of death as September 12, 1826. The church record for her death shows the date of death as September 17, 1826. On December 26, 1827, he married Phebe Lewis. In the following years, he had eight children with her. In order of birth they are: James Owen, William, Leonard, Prentiss Sylvester, Mary Jane, Benjamin, Nancy Jane "Jennie", George Lewis. You will note the unusual spelling of the name Phebe. This spelling was used in many of the early documents. Inasmuch as Phebe couldn't write, someone else wrote her name and she made her mark, an X, beside it (see daughter, Nancy Jane Bullock's birth record). Later on, her name appears in records spelled in the more traditional manner, Phoebe. Benjamin lived until January 30, 1846 when he passed away in Clarenceville. The church record for his death indicates that he was aged 58 years, 6 months when he died. This means that he was born in mid-1787, possibly in July. Phebe passed away on December 16, 1849 also in Clarenceville. Where Did Benjamin Come From? We don't actually know where Benjamin came from. He first appears on our radar when we see his name on a document dated February 22, 1819 showing that Benjamin had leased Lot #6 in the first concession on South river in the Seigniory of Noyan from N. C. Burton, Seignior, through the notary, Edme Henry. Nothing in this document or any subsequent documents actually say where he was born or where he came from. We do have a number of clues however. What are the clues we have? On the death record of Benjamin's son, Henry, father's place of birth is shown as England and his mother's as Canada. On the death record of Benjamin's son, Henry, Henry's birthplace is shown as Albany, NY. On the death record of Benjamin's son, Prentiss, father's birthplace is shown as Canada. On the death record of James Edward Bullock, father's birthplace (John, son of Benjamin) is shown as England. On the death record of Anne Eliza Hordly née Bullock, father's birthplace (John, son of Benjamin) is shown as Boston. On the 1880 census for Orlando Stever, his wife Mary Jane Stever née Bullock and daughter of Benjamin Bullock, (line 22) shows father's birthplace as Vermont. The daughter of Robert Thompson Dent, Harriet Dent, married John, the eldest son of Benjamin. It is possible that Benjamin and Robert Dent could be old friends from the same place. The headstone of Robert Thompson Dent , shows his birthplace as Yorkshire. On the 1861 Canada East Census, a Henry and Mary Bullock are shown as part of Benjamin's son, John Bullock's household. Henry and Mary are about the same age as Benjamin would have been. They are clearly family members, possibly Benjamin's brother and sister/sister-in-law, and their place of birth is shown as England. None of these clues tell us where Benjamin was born. They provide us leads, places to explore which might lead us to where Benjamin married Hannah Danford, to where some of the children were born, and maybe, to where Benjamin Bullock was born. This is the great brickwall for our family. Somewhere, someone out there may have a piece of information, a document which holds the key to enabling us to unravel our ancestry back still further than Benjamin, perhaps to the American colonies, or to England or to some other unthought of place. 1. Photo of Benjamin Bullock and Hannah Danford headstone taken at Union Cemetery, Clarenceville, QC, by Robert Bullock.